I just had an "interesting" experience with my new garage door opener causing interference mode on the Blitzortung RED. After getting the opener working right, I checked the Blitz cabinet just to check on things. To my dismay, RED was in serious interference mode. Checking the GUI confirmed that this was the case. Interestingly, the old Green detector was happy as could be. Inspecting the waveforms, and temporarily turning off the E-Field, confirmed my suspicions that it was not magnetic field. The 1m 9T loops were not bothered. Unplugging the new GDO, the interference mode ceased. I also tried disconnecting the pushbutton wiring connector, with no effect on the interference. I was able to reduce gain and increase the threshold voltage and restore some semblance of functionality. I took my "Natural Radio" VLF receiver and when the antenna was close to the "safety sensor" wires, there were some popping noises, that are probably edges from data transmissions to and from the sensors. My other RF sniffers, which use a coil didn't find anything. The VLF receiver has a whip antenna and is E-field. Initially, I added snap-on ferrite cores near the GDO head, but after some back and forth with Sparkfinder (Wes) on the sferics.us forum, we concluded that the safety sensors were the transmitting culprits. (Thanks Wes, et al for your suggestions) I also placed ferrites at the sensors just in case. The conclusion was that shielding of the wires was needed. I had some foil-backed insulation pieces that the former homeowner left over. I made a "shield/ground plane" by taping over the offending wires with copper tape. The GDO head was grounded, so I ran a ground wire from it to the foil side of the insulation. This fix was amazingly effective. I had reduced the gain to get the RED out of interference mode. With the shielding in place, I restored the gain I had previously. I even increased it beyond the earlier setting and it was still OK.
As has been pointed out to me, the location of the E-Field antennas in the rafters might not seem to be ideal. However, the 220V power lines feeding my house run directly over the garage and would place the antenna quite close to them. The location was my best compromise and worked well until I installed the new door opener. Another view showing the antenna better. 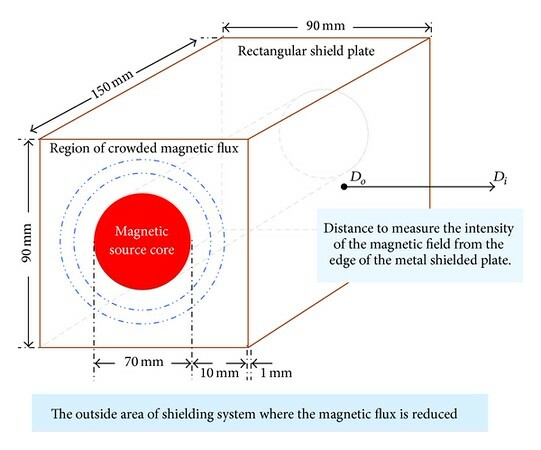 I am wondering if the shielding of the wires and the creating of a ground plane are both contributing. The offending wires are below the ground plane now, under the copper tape. The white wire is 110V power. The system actually won't detect 60Hz.... what we're seeing is harmonics, in image below about 3.6 -4.8 kHz.... but it is due to the mains box... along with the conversion and sampling rates what we sometimes see on the display is deceptive. The system does not really work like an "RF" or "Audio Frequency" amplifier,... most of the energy is contained, in this case, at 60Hz.. and that's out of the bandpass... the system shows energy during a certain time, at certain frequencies... and the higher '60HZ' harmonics have less energy... but they'll show a misrepresentation at times. I guarantee those images are due to mains... they were taken with the antennas right next to the power panel, as was this one a few moments ago. OK just wanted to know why a light bulb in my living room can cause interference,today I set my station up manually with settings 10.10.40 on both chanels. was running great all day I even was at the top spot in the station list. Now I'm at work and dad's at home he switched the living room light on now it's caused my station to go into interference mode will stay that way now until I finish my night shift in another 4 hours. Now how can I stop the interference from the light bulb. Thank for your reply I'll change the bald tomorrow. Its working good again now intill the light goes on.i'll put it into auto then. Just to let everyone know i solved my noise problem by changing the living room bulb to a led one the cfl i had caused noise interference led dosent so now i can keep my gains up on my lightning detector which gives me better detection all around and gives me better statistics. Thank you all who helped. The "Auto Amplitude Filter" reallly works well. I had a rather severe noise this morning, driving the old Green unit into continuous interference mode, and the RED was adapting like crazy trying to get rid of it. It had trouble dealing with the noise, being in interference mode most of the time. 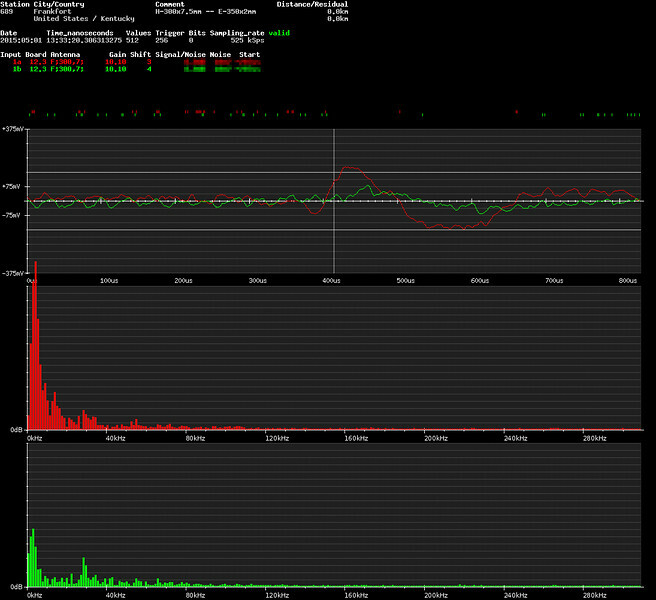 Although I didn't capture a "signals" image, it was a repetitive pulse of well over 100mV amplitude. The pulse width was in the lows "10s" of µ-seconds. No idea on what it was, since none of my "sniffers" would pick it up. No effect on E-Field and since both RED and Green were affected, it was definitely H-Field. I had to go to an extreme threshold on Green to get rid of the constant interference mode. Over ±550mV, whereas the original "default" is at about ±417mV. I typically run it at ±350mV when there is no noise present, which is the normal case. My Green is specially modified to allow a variable threshold, although with the controller out in the garage, this is not as useful as it once was when the controller was at my desk at my old house. On the RED, I was able to get the system out of interference mode, by activating the "Auto Amplitude Filter". This is the first time I was able to make an A-B-A test of the Auto Amplitude Filter. The RED system definitely entered and left interference mode when I toggled Auto Amplitude Filter. It really worked for this case of noise, which as previously described was repetitive in amplitude and frequency (at least the rep rate put it at the same point on the signals display every time). Previously, all other activations of Auto Amplitude Filter were kind of a blind guess, this time I could see the positive action of the filter. My lack of success with the various sniffers that I have built or bought (and the $$$) is frustrating sometimes. I will add a battery and a couple of VU meters to it and create a portable sniffer out of it. There is even a headphone jack already on it. I am sure that walking around with the box while wearing headphones will really impress the neighbors. Here comes the men in the white coats! At least I know it will work! We might be using "interference" as 'a disturber or noise that degrades communication or data, or a system's operation'. But we might also simply be referring to "a system going into 'interference' ". System RED (and BLUE will likely operate in a similar manner) will go into one of two types of "Interference Modes" from time to time. "Burst" or "Normal"
1. Because nearby active cells produce so many signals, so rapidly, that they cannot normally be recognized separately... and matter of fact, one "paradigm" of the developers might be phrased as "detected signals <30km are generally useless to the network" with the current design, anyway. So when you go interference because of nearby storms.... accept it, let 'er ride, and let the network do its net work. 2. Unless you have a perfect location, sporadic 'disturbers' such as an arcing power line, may produce conditional interference that swamps the controller similar to nearby cells, such are useless anyway. But they're sporadic, and when they cease, you'll come out of interference. 3. Repeating, identical, signals that might be caused by someone standing nearby with walkie-talkie, burst of repeating power line noise... weird stuff. 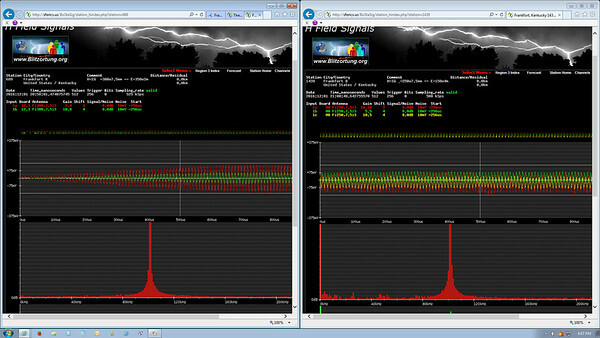 Now, while Interference Modes can be triggered by non-lightning signals, it is based on the "number of signals sent" within certain time frames. Except for the limited 'repetition and recurring' algorithms for "Burst Mode", it has no recognition of "types of signals" and doesn't care. Interference mode can be activated due to signals on all channels, or one single channel, or a combination if you're running 5 channels including both H and E field. It also is one 'controller parameter' that is monitored over time and varied by the server/controller! In other words, the server/controller can lower or raise those limits depending on what it sees from your station! You only have "indirect control' of this response: your operating mode, gains and thresholds, etc. The 'basic' purpose is to avoid sending "too many signals" or "EM noise pulses" from your station. you can come out of interference, and the limits will rise again after some period of time. So if over "some period of time" you've averaged over 70sigs/minute, you'll go into "Normal" interference, and stay there until it drops below 70sigs average.... which can be a long time... especially if the /controller has lowered the max limit temporarily for your controller to 15...! And if you are in Auto mode it could take even longer under certain conditions, as the controller may continuously cycle on and off and in and out of the mode. Remembering that you have only indirect control over 'Interference Mode" ... each channel's 'gain and threshold' settings. If you're in "Automatic" mode, you have no access to your gains and threshold settings. Unless you desire to wait until the sources vanish on their own, you'll have to return to "Manual" mode, and reapply gain/thresholds settings under each specific amp, (the actual gains /thresholds have been set by "Auto", and they are NOT visible under the AMP settings... that shows you your settings so you must hit apply to reset the "Auto" parameter. It follows, then, that if H channel A is the one causing the interference, you could back down channel A to 'just under noise trigger level, it will now come out of interference, and channel B continues its merry way, and A now is of some use also. Nice post and a very good explanation of an important distinction! Thanks, Mike. I was explaining this to another member privately a few days ago. You summarized it far better than I.
of all things, breast cancer! If your Americas region (3) station isn't on the station list, let me know... or if you need to change something... Email me. Second I don't think the problem is too severe here in Region 3, but I'm convinced a lot of new operators are using inadequate power supplies, causing some of their headaches. The way BLUE is designed, often grounding in some locations is causing more issues. I'm also convinced many are not spending enough effort to track noise sources... too bad. Not for the faint of heart. Third ANYBODY having an issue periodically with poor page loading on attempting access WEB controller? I either get a text-looking white screen with just headers or something. The display is blinking the "NET" icon and when I select with the "user" button, it complains about checking the network connection. The RED is on the same switch and WiFi Client as the Blue, and the connection is solid. A reboot clears it up, but it recurs after about a week. Is this an artifact of the http debug messages that Tobi added? I have been contemplating reverting the RED to the last stable release. I have to go out to the garage to reboot the unit. Interestingly, the data still appears to be getting through and is current on the List Of Stations. I wish that there was an SSH option to remotely reboot without the GUI (or the trek to the garage). Is this an artifact of the http debug messages that Tobi added? I don't think so. Here's what I'm speculating ... There's a whole lot of JUNK crap coming into the BT servers from a lot of crappy new BLUE installs... that's obvious. Thank goodness it doesn't seem to be centered in our region,. Also, I think they're doing some server work to help combat this. Also there have been some network crap into and in Europe. Now, the Server wants to 'talk to' the controller quite often. I think what's happening is the server and local controller hare having periodic issues communicating with each other... when the controller is in 'receive / adapt" mode, trying to get packets from server, and we also try to connect, ... that's when I think a lot of this is happening. So it sounds like it would be across the various FW versions and reverting isn't going to do much good, if your theory is correct. Hmm.. I hope that they come up with a fix. DDoS via Download? Is that what is going on? I've had the issue before, intermittently, on both Colors, with Various firmware... Jay also had an issue last couple of days... similar. By LAN accessing, I assume that you are going through your router; and WAN accessing bypasses it? If so, I would suspect a slow router. When I ditched my old D-Link router (and wasn't a cheap one) and built my own using pfSense installed on an ancient 450 MHz PC, there was a dramatic speed improvement. Do you have any half-duplex cards, switches, patch cables, etc. on your LAN? Those are identified by having four instead of eight contacts. All it takes is one, and it'll cut your entire LAN throughput by half. Same thing can happen if there's a broken wire or bad contact.